Today’s increasingly complex IT infrastructure deployments are pushing the limits and combining physical, virtualized, and cloud environments, as well as SDN. This transition has left some enterprises wondering if their current traffic analysis and performance management tools can get the job done. 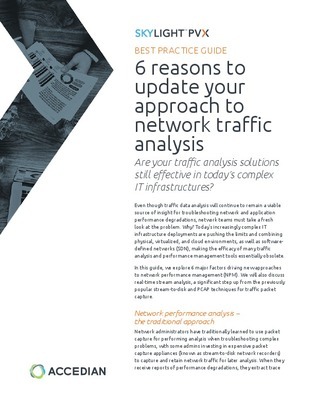 Discover 6 major factors driving new approaches to network performance management in this white paper. Also, learn how you can use real-time stream analysis for traffic packet capture.